"Denn, Ireland" redirects here. For other uses, see Denn. For other uses, see Cavan (disambiguation). 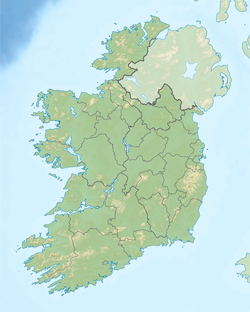 Cavan (/ˈkævən/; Irish: an Cabhán, meaning "the hollow") is the county town of County Cavan in Ireland. The town lies in Ulster, near the border with Northern Ireland. The town is on the main N3 road that links Dublin (to the south) with Enniskillen, Ballyshannon and Donegal Town (to the north). Cavan was founded by the King of East Breifne, Giolla Íosa Ruadh O’Reilly, sometime during his lordship between 1300 and his death in 1330. During his lordship, a Franciscan friary was established close to the O’Reilly stronghold at Tullymongan and was at the centre of the settlement close to a crossing over the river and to the town’s marketplace. The friary’s location is marked by an eighteenth-century tower in the graveyard at Abbey Street which appears to incorporate remains of the original medieval friary tower. 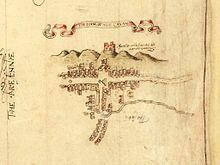 The imprint of the medieval town can be followed in the area of Abbey Street, Bridge Street and Main Street (townlands of Tullymongan Upper and Lower). The O'Reillys later built a new castle in the late fourteenth century on Tullymongan Hill, overlooking the town centre. In the 15th century, the local ruler, Bearded Owen O'Reilly, expanded the town marketplace which attracted merchants from Dublin and Drogheda. The phrase "life of Reilly" is believed to derive from the great wealth and power of the O'Reilly clans, some of which came from their market. They also allowed counterfeit English and Scottish coins to be minted in their territory at this time. King James I granted the town a charter in 1610. This also entitled Cavan town to send two members to the Irish parliament. In February 1690 it was the site of the Battle of Cavan between Williamite and Jacobite troops, during which much of the town was burned. The Jacobite general William Nugent was killed during the battle. Later, during the 18th century, local administrative influence and power passed to the Maxwell family, descendants of Robert Maxwell, Church of Ireland Bishop of Kilmore (1643–1672), a family who later entered the peerage as Baron Farnham. Farnham House, located at Farnham, a small rural district to the north-west of Cavan, is one of the largest country houses in the county. It was built for Barry Maxwell, 3rd Lord Farnham (later created, by the second creation, Earl of Farnham), head of the Maxwell dynasty, around 1780. The house was designed by James Wyatt. It was extended in 1810 to the design of Francis Johnston, a County Armagh-born, but Dublin-based, architect. It was sold by Diana, Lady Farnham (widow of Barry Maxwell, 12th Lord Farnham), to a local entrepreneur[when? ], and the house and estate has per 2006 been converted into a luxury hotel and leisure complex under the Radisson SAS international hotel group. Developments in Cavan during the early 19th century saw the building of a new wide street that still bears the name 'Farnham Street'. This was lined with comfortable town houses, public buildings (such as the courthouse which dates from 1825) and churches. From the mid-19th century, Cavan became an important rail junction for the Midland Great Western Railway (MGWR) and those of the Great Northern Railway (GNR). The Town Hall was built in 1908–1909. In 1938, work began on the Cathedral of Saints Patrick and Felim, the main church of the Catholic Diocese of Kilmore. Five kilometres (3 mi) south-west of Cavan Town, on the R198, is the Church of Ireland Kilmore Cathedral, which contains a Romanesque doorway dating from the 12th century, reputed originally to have come from Trinity Abbey, located a short distance away upon Trinity Island in Lough Oughter. Most of the neo-Gothic Kilmore Cathedral was built in the late nineteenth century. A short distance from Kilmore Cathedral is the See House, a late Georgian-style house constructed in the 1830s. This house, designed by William Farrell, was formerly the official residence (or "Bishop's Palace") of the Church of Ireland Bishops of Kilmore, Elphin and Ardagh. On 23 February 1943, a fire at St Joseph's Orphanage in the town claimed the lives of 35 children and an elderly woman. A public inquiry found no culpability on the part of the nuns who ran the orphanage, but the circumstances surrounding the high death toll in the fire remain controversial to this day. The secretary of the Commission of Enquiry, Brian O'Nolan, is better known to posterity as the writer Flann O'Brien. He certainly felt that the Commission had not found the truth. The former Cavan Town Royal Irish Constabulary Barracks was demolished in 1968. Its successor stood on the corner of Farnham Street (also known as Casement Street, named after Sir Roger Casement) and Abbey Street. The current Garda Station is further along Farnham Street, just across from the Courthouse. Adjacent to the Courthouse is the Cavan Central Library building constructed in 2006. The entrance is dominated by an aquarium, with commissioned bog oak sculptures by local artist Joey Burns that portray Cavan history. An arts feature based on Gulliver's Travels enriches the interior space, and two large paintings by award-winning author PJ Lynch were commissioned by Cavan Library Service, in a lasting tribute to Jonathan Swift and to Cavan where Gulliver's Travels was written. In the 1990s and 2000s Cavan town expanded rapidly with extensive urban regeneration and suburban expansion. It is the main economic hub of the north central part of Ireland and has an extensive range of financial services, legal, medical, industrial and retail enterprises. Liberty Insurance Ireland, Obelisk Group and CG Power Systems Ireland are a number of major national and international companies whose head offices are located within the environs of the town. The Town Hall located in Market Street, Cavan. The Town Hall was designed by William Scott, the well-known Dublin architect, for the then Cavan Urban District Council. The hall was constructed between November 1908 and late 1909, with it being officially opened on Wednesday, 19 January 1910. The building was officially opened by Mrs. Henrietta Smith (who also laid the foundation stone), wife of Councillor Louis C.P. Smith, the Chairman of Cavan Urban District Council at that time. The relatively small and unostentatious Town Hall, located on Townhall Street, is built of sandstone from a quarry at Latt, on the northern edge of Cavan Town, while the original slates came from near Carrick-on-Suir in County Tipperary. The building appears to be designed and built in a version of the Arts and Crafts style of architecture. It underwent significant redecoration and refurbishment in the 1980s, under the direction of Cavan architect Philip Cullivan. Each March, since 1946, the Town Hall has played host to the Cavan International Drama Festival, a competition which has always drawn the finest in amateur drama. After the abolition of Cavan Town Council left the building empty in 2014, the building reopened in 2015 as the local arts centre, under the name 'Townhall Cavan'. There are about 30,000 people living within a 16 km radius of the town. [original research?] Although a more accurate perspective taken from the 2011 national census puts the urban population at 3,607 persons, an 8.3% population decrease on earlier census results. With the rural Cavan population at 7,160 persons an increase of 47.2% since the 2006 census was undertaken. The town is located on the junction of two national routes, the N3 to Dublin and N55 to Athlone. The National Development Plan provides for a major upgrading of the route with an M3 motorway from Kells to Dublin (completed and officially opened on 4 June 2010) and type 2 dual carriageway from Whitegate on the Meath border to Cavan, which will eventually bypass Virginia too. The N3 and N55 eastern bypass around Cavan town was fully completed in March 2006, eliminating the need for heavy traffic to pass through an already congested town. Although Cavan has no railway links today, there were once two railway stations on separate lines, linking the Great Northern Railway (GNR) and Midland Great Western Railway, then an end junction of the Belfast-Cavan route linking Clones with a branch line to Crossdoney and Killeshandra. With the Cavan-Dublin route, via Inny Junction, Longford and Mullingar on the Dublin-Sligo railway line. There is an old railway line running through Kingscourt on the border of County Meath; this line is now overgrown. A branch of the Cavan and Leitrim Railway was also indirectly linked to Cavan town via Belturbet (the C&L terminus) and Ballyhaise on the GNR line. When the Government of Northern Ireland closed the section of the Belfast line from Portadown to Glaslough in 1957, it was found to be uneconomical to keep running the rump section from Monaghan to Cavan. All these lines (including the Cavan and Leitrim Railway) were closed by 1960. The (GNR) Virginia Road Station, from 1863 to 1958 serviced the Drogheda and Navan extension route to Kells and Oldcastle. Cooperation between the Cavan and Westmeath county councils is striving to integrate this into the national and regional development plan. Cavan railway station opened on 8 July 1856, closed for passenger services on 14 October 1957, and finally closed altogether on 1 January 1960. Cavan's bus station is owned by Bus Éireann and is located on Farnham Street. It is a single-storey accessible building with a ticket office, waiting room, public 'phone, restaurant and toilets. The station is served by the Donegal Town – Enniskillen – Dublin Airport – Busáras Expressway route 30 which generally operates every two hours in each direction. Route 165 operates less frequently to Athlone and Belfast. The station is the terminus of several local routes, including route 109 to Dublin, which operates hourly each way. Other local routes are the 111 to Ballinagh, Granard, Castlepollard and Athboy, the 162 to Monaghan via Cloverhill and Clones, the 166 to Dundalk, the 175 to Monaghan via Cootehill and the Tuesdays-only 465 to Carrigallen. Leydons Coaches operate route 930 to Enniskillen via Belturbet, Ballyconnell, Bawnboy and Swanlinbar. Whartons Travel operate a route to Longford railway station via Crossdoney, Arvagh, Drumlish and Longford. 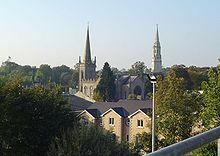 Cavan town has four secondary level schools: Saint Patrick's College, Loreto College, Breifne College, and the oldest, Cavan's Royal School, founded in the early Seventeenth century. Breifne College is a co-educational Vocational Education School administered by the County Cavan Education and Training Board. Saint Patrick's College and Loreto College are retrospectively all boys and all girls catholic voluntary schools, with The Royal School been a co-educational school with a Protestant ethos. These schools are administered by their retrospective patrons in conjunction with the Department of Education and Science. The town has a third level college, Cavan Institute  (formerly Cavan College of Further Studies), which was founded in 1985 and is the largest provider of FETAC courses in the northeast region. The college offers Further Education and Training Awards Council (FETAC) across its five schools; Business & Humanities, Healthcare, Sport & Education, Beauty Therapy & Hairdressing, Computing, Engineering & Science Design, Performing Arts & Services. Graduates are entitled to exemptions within most third level colleges and usually transfer to study a degree further completing their course by in their chosen field. The majority of students are Cavan locals, with a large proportion of its other students coming from Leitrim, Roscommon, Monaghan, Meath and Westmeath. The college's main campus is located on Cathedral Road with other sites in the town centre and at the former Army Barracks on the Dublin Road. The guiding principle as stated by Cavan County Council: "The unique and diverse heritage of County Cavan is conserved, sustained and, above all, cherished and celebrated by the people of the County". The example of Cavan's uniqueness can be best defined by its location in the heart of Irelands lakelands, a region so diverse that its potential has yet to be determined in a viable Biochemical Action Plan. The wildlife and wetlands environment of County Cavan's loughs is nationally and internationally recognised and offers substantial and unique opportunities for sustainable tourism development. Lough Oughter and Killykeen located just a few kilometres from Cavan town already has the core infrastructure for further durable and ecotourism development. In 2010, 2011 and 2012, Cavan Town hosted the Fleadh Cheoil na hÉireann. The 2010 Fleadh was held from the 16th to 22 August. The Fleadh is the premier annual Irish traditional music, song and dance festival and series of competitions, which is run by Comhaltas Ceoltóirí Éireann (CCÉ). Fleadh 2010 was the 50th annual Fleadh Cheoil na hÉireann, and the first to be carbon neutral. That year it returned to Cavan for the first time since 1954. Up to 250,000 visitors attend the annual Fleadhann, and about 10,000 musicians compete. It is also estimated that the annual All-Ireland Fleadh generates €20-€25 million for the local economy of its host town. ^ "Sapmap Area - Settlements - Cavan". Census 2016. CSO. 2016. Archived from the original on 13 January 2018. Retrieved 12 January 2018. ^ Parker, Kieran (1992). "The Ui Raghallaigh Lordship of East Breifne c.1250-.c. 1450". Brefne. 8. 2: 415. ^ Parker, Ciaran (9 February 2007). "The Battle of Cavan, 1690". Cavan Echo. ^ "First ever Radisson SAS resort in Ireland to open at Farnham Estate in Cavan - HoganStand". www.hoganstand.com. Archived from the original on 17 August 2016. Retrieved 3 May 2018. ^ "Radisson Blu Farnham Estate Hotel, CavanHotels". www.irelandin1.com. Archived from the original on 3 May 2018. Retrieved 3 May 2018. ^ Parker, Ciaran (23 February 2007). "Cavan's darkest day". Cavan Echo. ^ a b Parker, Dr. Ciarán, 'Cavan Urban District Council – A Brief Look Back' in Scott, Dr. Brendan (Ed. ), Cavan Town, 1610–2010: A Brief History. Cavan Town Council, Cavan, 2012. ^ Parker, Ciaran (12 January 2007). "Cavan's Town Hall Ball". Cavan Echo. ^ "About Us - Townhall Cavan Arts Space". www.townhallcavan.ie. Archived from the original on 15 November 2017. Retrieved 3 May 2018. ^ "Cavan station" (PDF). Railscot – Irish Railways. Archived (PDF) from the original on 17 February 2011. Retrieved 16 September 2007. ^ "Bus Éireann - View Ireland Bus and Coach Timetables & Buy Tickets". www.buseireann.ie. Archived from the original on 30 November 2016. Retrieved 1 December 2016. ^ Leydons Coaches Archived 8 June 2013 at the Wayback Machine. Leydons Coaches (11 February 2013). Retrieved on 23 July 2013. ^ Portal, Longford. "Home | Longford.ie". www.longford.ie. Retrieved 2016-12-01. ^ Cavan to Longford Bus – Longford to Cavan Bus Archived 22 December 2015 at the Wayback Machine. Whartons Travel. Retrieved on 23 July 2013. ^ "Saint Patrick's College, Cavan". stpatscavan.com. Archived from the original on 3 January 2018. Retrieved 3 May 2018. ^ User, Super. "Home - Loreto College Cavan". www.loretocavan.ie. Archived from the original on 13 March 2018. Retrieved 3 May 2018. ^ "Royal School Cavan". www.royalschoolcavan.ie. Archived from the original on 7 December 2017. Retrieved 3 May 2018. ^ "Sustainable Tourism | Sustainable & Responsible Planning and Management for the Tourism Industry". www.sustainabletourism.net. Archived from the original on 2 December 2016. Retrieved 1 December 2016. ^ "The International Ecotourism Society | Uniting Conservation, Communities, and Sustainable Travel". www.ecotourism.org. Archived from the original on 3 December 2016. Retrieved 1 December 2016. ^ Hogan, Sinead (14 September 2011). "Cavan hat-trick as Fleadh 2012 is secured". The Anglo-Celt. Archived from the original on 18 November 2011. Retrieved 24 November 2011. Scott, Brendan (Editor), Cavan Town, 1610–2010: A Brief History. Cavan Town Council, Cavan Town, 2012. Wikimedia Commons has media related to Cavan. Look up Cavan in Wiktionary, the free dictionary. Wikisource has the text of a 1911 Encyclopædia Britannica article about Cavan.